The Tawny Frogmouth is found throughout Australia. It is nocturnal and has a distinctive "oom oom oom" call. It sounds a bit like a motor that won't start. 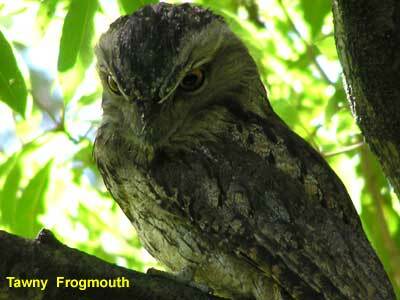 The Birds in Backyards website has some great details on the Tawny Frogmouth including its call. It is a common misconception (which I for one had) that a Tawny Frogmouth is also called a Mopoke and makes the plaintive "mopoke" call at night. In fact a Mopoke is a Southern Boobook Owl and it makes the call. The brilliant Owl Pages web-site explains this. 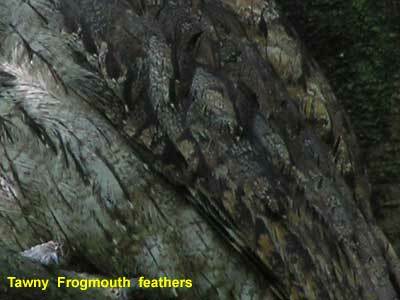 The marbled feathers of the Tawny Frogmouth show how it blends in with the trunk of trees and dappled light. 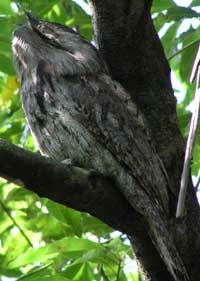 The Tawny Frogmouth is not an owl - being more closely related to a Kookaburra. It is about 50cm from head to tail. The male (as shown here) has greyer plumage; the female's is browner.